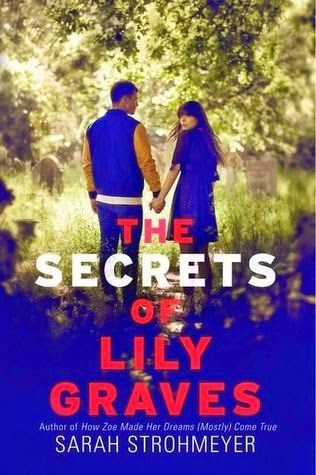 Summary: Growing up in a house of female morticians, Lily Graves knows all about buried secrets. She knows that perfect senior-class president Erin Donohue isn’t what she seems. She knows why Erin’s ex-boyfriend, hot football player Matt Houser, broke up with her. And she also knows that, even though she says she and Matt are just friends, there is something brewing between them—something Erin definitely did not like. But secrets, even ones that are long buried, have a way of returning to haunt their keeper. So when Erin is found dead the day after attacking Lily in a jealous rage, Lily's and Matt’s safe little lives, and the lives of everyone in their town of Potsdam, begin to unravel. And their relationship—which grew from innocent after-school tutoring sessions to late-night clandestine rendezvous—makes them both suspects. As her world crumbles around her, Lily must figure out the difference between truth and deception, genuine love and a web of lies. And she must do it quickly, before the killer claims another victim. Review: I fell in love with a cover and got a little bit burned. I should probably preface that I went into this book cold. Normally before I buy a book I check goodreads, and ask for second and third opinions, sometimes consulting Kirkus, and even then I usually sit debating for a while, but I saw this cover and thought, "Oh my heck! I had that haircut for years! I should buy this book!" (Don't question my logic, it cannot stand up to reason.) I read the back, it sounded reasonable, like something I might be interested in, and it seemed quick. I've been dying for a quick read. I didn't guess the ending until about 1/2 way through the book (but take from that what you will, although I love mysteries, I rarely read them), but Erin's unflinching ability to keep a narrow mindset, especially towards the end read gnawed on my nerves. The ending was also incredibly rushed. I wish that is had been drawn out a little bit.